A great gift for garden enthusiasts. 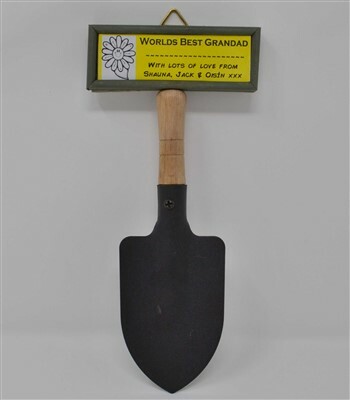 Our adorable personalised hand trowel ornaments can take pride of place in tunnels, sheds, conservatories etc, personalised to your requirements. Please indicate the text you would like printed on the top and also on the bottom as the text included in samples is purely to show what is possible. These ornaments are suitable for male and female. They also make a beautiful addition to a pot plant as a gift. A really great gift for Dads, Mums, Grandads, Grandmas, Other halfs, kids - a real little gem of a gift for anyone interested in gardening or for just for a bit of fun. Size: 23.5cm x 10cm. Ornamental use only, not suitable for outdoor use.